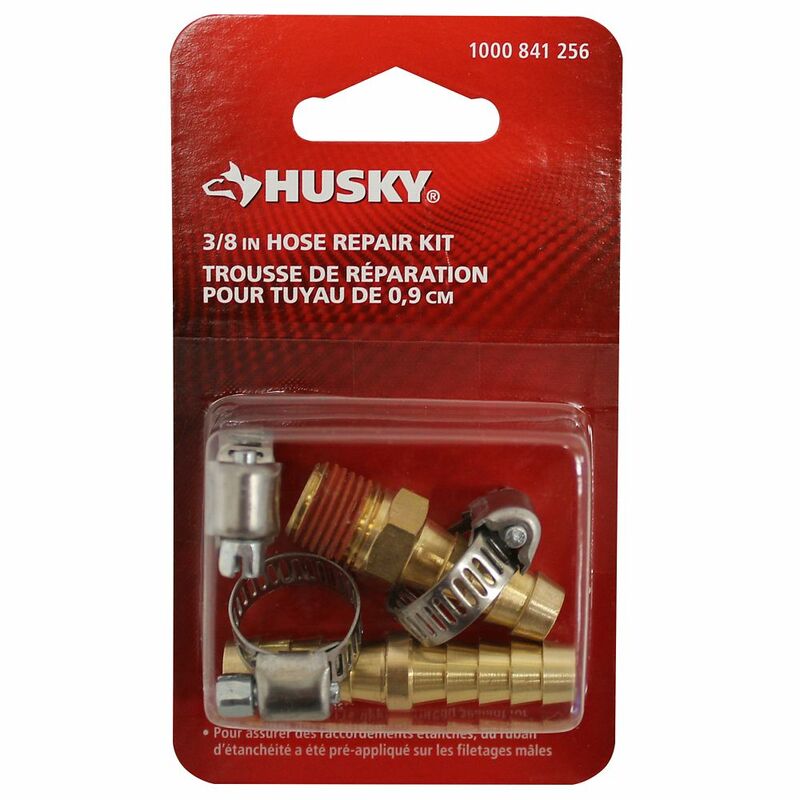 This Husky 5-Piece Hose Repair Kit features a hose end and a handy splicer for repairing damaged air hoses. The hose fittings are made from brass and are corrosion-resistant. The male threads on the hose end are compatible with tools, fittings or quick-connects. Simply secure hose to barb with one of the three provided hose clamps to repair. The Husky 5-Piece 1/4 inch Industrial Coupler Kit includes fittings that provide high airflow to the tool in use thanks to the tubular-valve body design. The kit features fittings with heat-treated lock balls and brass construction that promote long service life. The sleeve guard helps reduce the risk of accidental disconnects and protects the coupler sleeve. Includes one 1/4 inch female NPT coupler and four 1/4 inch male NPT plugs. The Husky 13-Piece Brass Air-Compressor Accessory Kit includes a blow gun, air chuck, inflation needles, plugs and couplers. It is made for long service life and hassle-free connections without confusion about coupler sizes. The fittings have an easy-connect design with solid brass construction that resists corrosion and wear. The Husky 16-Piece Air Compressor Accessory Kit comes with a blow gun and accessories to help clean areas and inflate objects. This accessory kit features a nylon recoil hose with couplers and plugs for connection purposes. Features durable steel construction with zinc plating for corrosion resistance. This is a great starter kit for anyone with a compressor to give you all the tools needed in connecting and use for your airline needs. 3/8 Inch Repair Kit This Husky 5-Piece Hose Repair Kit features a hose end and a handy splicer for repairing damaged air hoses. The hose fittings are made from brass and are corrosion-resistant. The male threads on the hose end are compatible with tools, fittings or quick-connects. Simply secure hose to barb with one of the three provided hose clamps to repair.